Some of our used vehicles may be ex-fleet or multiple user. Please ask about the previous owner when making your enquiry. 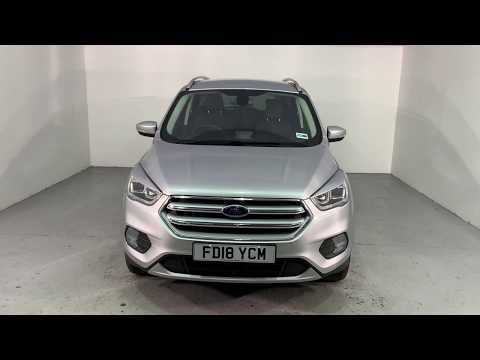 This Ford Kuga is a stunning looking vehicle, it comes with optional extras including the appearance pack which includes privacy glass and roof rails. This makes this Kuga stand out from any other. Finished in one of Fords most popular colours it really does stand out from the rest. You also benefit from built in sat nav making sure you never get lost again along with rear camera and rear parking sensors making it a breeze to park. With the new 2.0 Diesel engine this car offers fantastic power of 180ps making it a joy to drive. This car has been through our intensive preparation process including a full 100 point check by a Thame Cars technician along with a fresh service. Once it’s finished it moves on to our Autoglym trained team who give the car a full showroom valet making sure it is close to brand new as we can possibly make it. This car also benefits from the remainder of the Ford warranty which expires July 2021. We’re a platinum black horse dealer so feel free to call us for an instant over the phone quotation or go to our website www.thamecars.co.uk for our online finance tool along with 20 photos and a video of every car. With over 70 cars in stock at any one time we will have something to suit your needs. When you purchase a car from us at THAME Cars, it will usually come with manufacturer’s warranty which can vary from anything between 3-5 years. As most of our vehicles are under 2 years, you will benefit from the remainder of the manufacturer’s warranty, however this varies on the make and model of your new car. We also offer an additional market leading warranty by AutoTrust for that extra peace of mind. This warranty helps towards covering the cost of those unexpected repairs. What does Autotrust warranty include? Your warranty covers almost all mechanical and electrical components on your vehicle against mechanical and electrical breakdown. Full breakdown cover- (60 days warranty cover whilst on the continent). Welcome to Thame Cars. To optimise your experience, cookie settings on the website are set to allow all cookies. By continuing your journey throughout the website, you consent to this. You can change these settings here. Financial disclosure We can introduce you to a limited number of finance providers and may receive a commission from them for the introduction. All finance applications are subject to status, terms and conditions apply, uk residents only, 18s or over, guarantees may be required.